Ice rinks can be found near schools and kindergartens in Björköby, Norra Vallgrund, Replot, Södra Vallgrund and Söderudden. The illuminated ski track for classical skiing begins at Bodagården and is 2.4 km long. The illuminated ski tracks start at the sports field and are 1.8 km and 2.8 km long for classical style skiing. You can also choose a 6 km long terrain track for classical style skiing, of which 2.8 km are illuminated. The illuminated ski track for classical skiing begins at the sports field and is 1.4 km long. 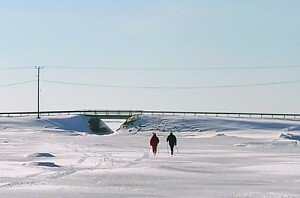 The snowmobile track can be found by the road to Vallgrund. The track is 600 m in length.